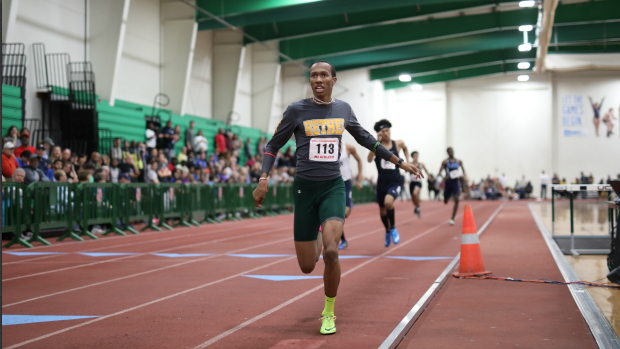 A pair of Virginia's best 5A athletes will make the trip to this weekend's New Balance Nationals harboring expectations of finding their way to the medal stand after explosive performances in the State meet, held two weekends ago. EJ Richardson's three gold medal performance, punctuated with a come-from-behind anchor leg win for his Bethel HS in the 4x400 may have marked the most explosive moment on the track for 5A boys. Yet, Atlee pole-vaulter William Chapman has an equal, if not better, shot at making it to the medal stand in New York this weekend. Chapman, who broke the Virginia 5A state meet record with his 16-5 vault, was 11 inches ahead of his nearest competitor, in either the 5A or 6A classes. In Chapman's case, he benefits from the absence of all-American sensation Armand Duplantis' absence. Duplantis, the Louisiana wunderkind, has raised his national high school record to an unheard of height of 19-3.5, and he will continue competing in higher level meets against national and world caliber competition. With the Cajun leapfrog out of the meet, Chapman's aspirations become more realistic. The senior was 19th last year, but vaulted 14-9.5 last year. If he can make it over the sixth height of 16-9.25, he should be within striking distance of KC Lightfoot, who cleared 17-1 last year in a runner-up effort and is the top returning vaulter. Expect to see Zach Bradford (Bloomington, IL) in contention, as the senior placed fourth last year at 16-9.25. Meanwhile, Richardson placed fifth in the open 400 last year with a 47.96 time, behind both Tyrese Cooper, who won the race in 46.55, and Brian Herron, who placed second at 46.69. For Richardson, the bad news is that all three runners were sophomores last year, and all will be returning to run this weekend. Herron drew first blood at the Virginia Showcase in February when he broke the HS mark for the 300, defeating Cooper in the process. Overall, the duo has rewritten the quarter-mile prep records, with Herron and Cooper both holding the freshman standard (47.97), while Cooper owns the sophomore mark at 46.01. With Cooper tasting revenge, Richardson may be aiming for a third place finish. Regardless, Richardson could be a medal winner in a national or meet record race. The Armory HS record is 46.12, while the national HS mark stands at 45.92, run by Elzie Coleman of Newburgh (NY) HS in 2004.